In a mixing bowl, combine flour, sugar, baking powder, cinnamon, nutmeg and salt. In another bowl, beat egg yolks slightly. Beat in milk and cooking oil. Add the egg yolk mixture to the flour mixture all at once. Stir just until combined, but still slightly lumpy. Stir in chopped apple. In a small bowl, beat egg whites with an electric beater until stiff peaks form. Gently fold beaten egg whites into batter. Be careful not to over-mix. When done, use a fork to lift waffle off grid. Repeat with remaining batter. Serve with warm topped with warmed apple pie filling, chopped pecans and a drizzle of maple syrup. This apple waffle recipe uses beaten egg whites to make the waffle fluffy and light. 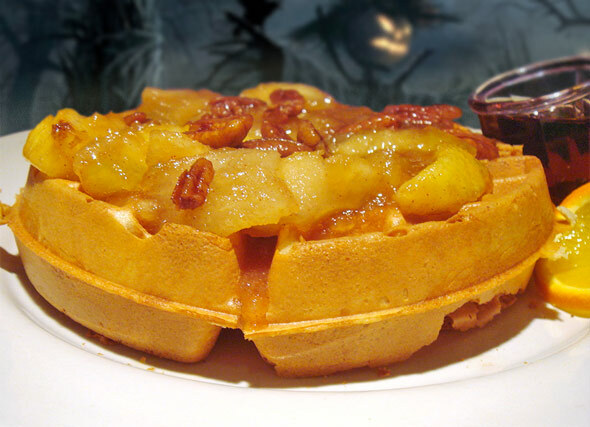 It's topped with apple pie filling, pecans and maple syrup for an appetizing apple experience. Mr Breakfast would like to thank cantinanana for this recipe. Recipe number 585. Submitted 9/14/2002.